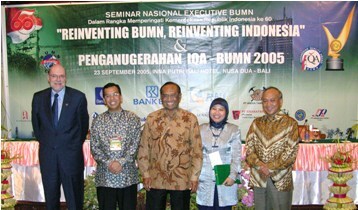 I have been fortunate to travel to and work in Indonesia 30 times since 2001. 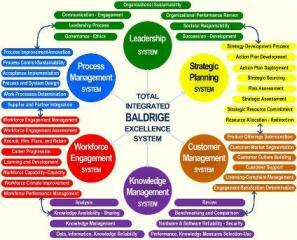 The photo below is my first assignment conducting Baldrige Self-Assessment Training for PT Telkom. Telkom asked me to lead Assessment Site Visits for 6 weeks at the end of the training. I have now worked more than one year of my life in Indonesia. The Business Excellence seminar in Jakarta and sponsored by PT MUMA was special with leaders from banking, mining, steel, petroleum, telecommunications and other sectors participating. It does not get any better than being selected by the Asian Productivity Organization (APO) to guide the development of the Asian Productivity Organization's Business Excellence Consulting Manual to train the Business Excellence Consultants in most Asian nations including members from Japan, Singapore, Malaysia, Philippines, Mongolia, Thailand, Fiji, Taiwan, India, Cambodia, Vietnam, Sri Lanka, and Pakistan. Replacing incapable core processes with highly capable ones causes a shift in your improvement rate from gradual to breakthrough. I can do this for you for any process or system in the graphic or I can teach you how to do it. Please contact me and I will be pleased to discuss this with you or visit with you. 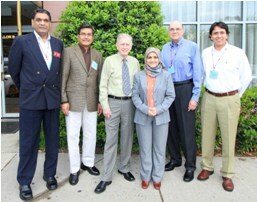 2008 NIST Baldrige Examiner Training - Achwan Effendi (2nd from left), Dr. Curt Reimann (Father of Baldrige Award), Paul Steel (May 2008, Washington, DC). Also shown are Baldrige Foreign Examiners from Singapore, Saudi Arabia and Chile. 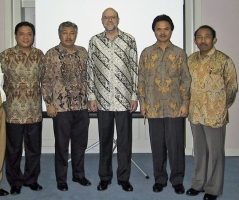 Indonesian Baldrige Training: Make sure your organization receives its Baldrige training from a Senior Baldrige Examiner. Only Senior Examiners receive Team Leader training which changes each year. 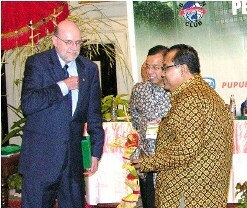 I have worked hundreds of days in Indonesia since 2000 and enjoyed every minute. I am very proud that the people and organizations that I have trained and consulted with have progressed to the highest Baldrige levels in Indonesia because they agree with my focus on process excellence. I also enjoy contributing in any way I can to the national program to increase the use of the Baldrige Criteria (MBCfPE) nationwide. Please contact me if you would like to meet to discuss how your organization can benefit from using the Kriteria Baldrige. As a Malcolm Baldrige Senior Examiner, I enthusiastically welcome the opportunity to contribute my Baldrige Award experience and Indonesian experience to your organization's success. 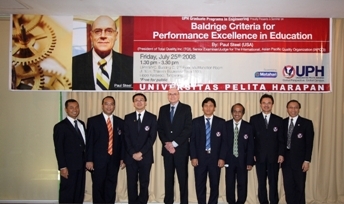 See photos of many of the more than 700 Indonesians I have trained across Indonesia since 2001.Click here to see why you want Paul Steel to conduct your Baldrige Training.